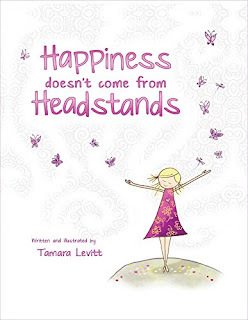 Happiness Doesn’t Come from Headstands by Tamara Levitt is a lovely spin on the idea of teaching kids trying and trying again equals achievement. Children are often taught this idea; therefore, they often become frustrated because the end result doesn’t equal achievement or lead to perfection or happiness. This is where this wonderful children’s book is effective. Little Leela loves yoga, but no matter how hard she tries, she is still struggling to learn how to do a headstand independently. She becomes frustrated and envious when the other children in yoga class succeed with this feat. Until her kind friend, Lyle, points out all the great things Leela already can do. He helps her see that happiness does not come from headstands, but instead from being happy with herself. I applaud Tamara Levitt for presenting a difficult lesson in a way all children can understand. If you have a child who struggles with perfectionism or is anxious about completing tasks, this book will be a helpful tool to have on hand. It will make a great addition to your children’s bookshelves.